Since Sandy Hook approximately three years ago, there have been hundreds of mass shootings. After each, there is an outcry for increasing the scope of federal law to require the more extensive and inclusive use of background checks. But, after each horrific event, Congress does nothing, and we brace ourselves for the next senseless killing. To be sure, Congress needs to strengthen federal law, but there would still remain the problem that much gun violence is caused by those who are not the purchasers. That issue could be solved by pursuing another path that would immediately improve gun safety and reduce violence without the enactment of a single federal law. That strategy is to encourage the manufacture and sale of "smart guns." It will happen if Congress simply repeals a federal regulatory law that grants gun manufacturers immunity from product liability suits -- suits that can be brought against sellers of all other consumer products sold in the United States. 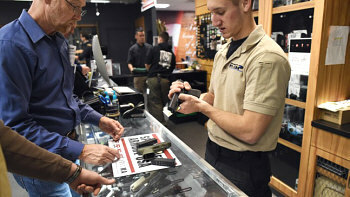 Smart guns, otherwise known as "personalized firearms," are firearms with imbedded technology that prevents a weapon from firing if not used by an authorized user. It will prevent shootings, both intentional and unintentional, by children, gun thieves and other unauthorized users. Two types of smart technologies presently exist: biometric sensors, which allow the gun to detect the fingerprints or grip of the authorized user, and token-based technology, which prevents the gun from functioning outside of the presence of a particular watch, ring or other device. Location devices are other mechanisms that can easily be incorporated into any weapon and would allow any owner or law enforcement personnel to locate a missing or stolen gun. Yet again, this misplaced enthusiasm for 'smart Guns' has raised its head. We have discussed the subject many times (just do a search), and the overall assessment remains the same - building that sort of technology into a gun is hardly a move towards reliability, (hi-tech door stops?) - it's another form of 'gun control'. "The epidemic of gun violence that currently plagues America will continue unless we take a multifaceted approach" - ahh, so 'smart guns' will solve everything? Won't worry the bad guys anyways.